THE OUTGOING OMBUDSMAN for Children Emily Logan called the closure of St Patrick’s Institution an “unfinished project” for the government. She said that despite it being in the Programme for Government and despite the announcement that it was to be closed down last July, there are still eight “vulnerable” boys being held there. Speaking at the launch of her final report in office, she said the intention was that young people under the age of 18 would be detained in the new Oberstown Campus, but as it required expansion and reorganisation, young people would be held in the interim at Wheatfield Prison. She said she was happy enough with that arrangement when the majority of the young people were moved, as having seen the Wheatfield Prison, she believed there was an entirely different culture than at St Patrick’s Institution and the facilities were better. It was not to be a long term solution, but there was an entirely different culture there [Wheatfield]… the boys hygiene was much better there, they could wear their own clothes… and there was no punitive practices there as a number of them had previously been victims of violence in St Patrick’s. However, she said she met with the Oireachtas Committee on Health and Children to highlight her concerns about the delay to the Oberstown project. She said she highlighted as a matter of urgency that all young people need to be moved from the institution. Logan said she had written to the Minister for Justice Frances Fitzgerald calling on her to designate Wheatfield in the interim, until Oberstown is completed, and remove all young people from St Patrick’s Institution. She claimed that the boys being held there weren’t seen as children, but as prisoners and her office received complaints in relation to acts of violence against the young boys. One complaint made by a mother of one of the boys relates to an assault by another inmate, where her son received significant injuries. She said she was not informed of the hospitalisation of her son and also was critical of the use of P19 disciplinary actions, in which visitation was withdrawn. The OCO said they were concerned that a parent was not informed of a significant assault against their child and also recommended the re-examining of P19 disciplinary action. On another occasion the office also wrote a letter to St Patrick’s Institution in relation to an alleged assault on a boy by a member of staff, voicing their “dissatisfaction” with the internal investigation into the matter. The complaint was forwarded to the Inspector of Prisons, much to the satisfaction of the OCO, the report stated. “It is very important that these vulnerable young boys that remain in St Patrick’s Institution are not forgotten,” she concluded. Email “Closure of St Patrick’s Institution is 'unfinished' as 8 boys remain locked up”. 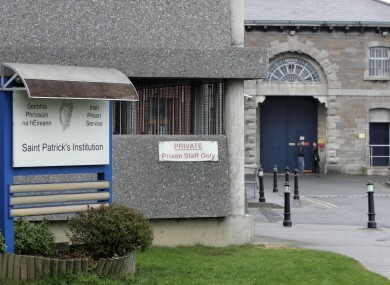 Feedback on “Closure of St Patrick’s Institution is 'unfinished' as 8 boys remain locked up”.